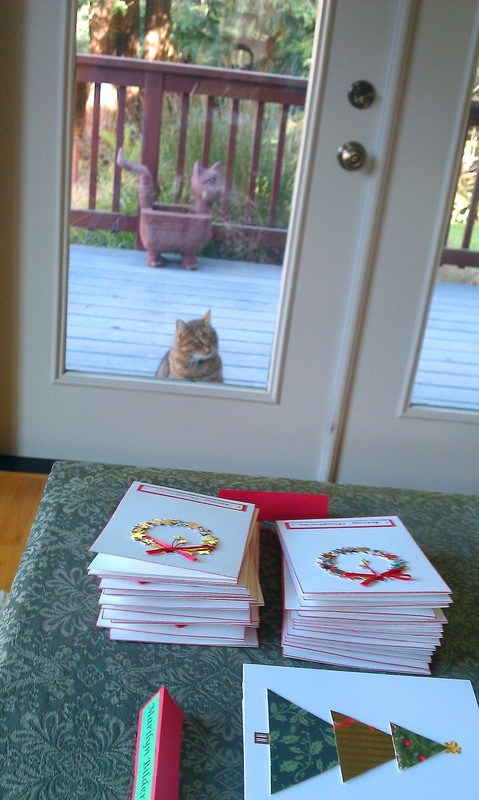 Some of us were SO eager for the exchange to begin! The collections starts to take shape. 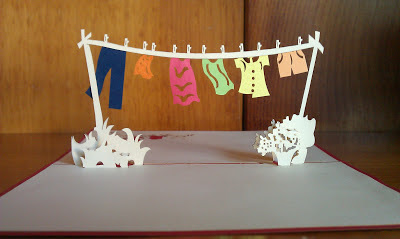 A special non-holiday card for our enjoyment—sent by Becky L. She purchased this in Vietnam because she is a book artist who loves laundry hanging on clotheslines. Of course, we love our finger foods too. Won't you think about joining this special exchange next year! 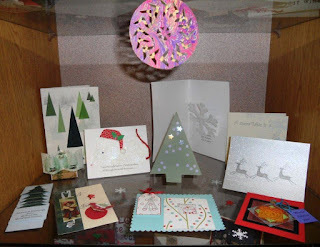 It's Not Too Late for Holiday Card Inspiration! 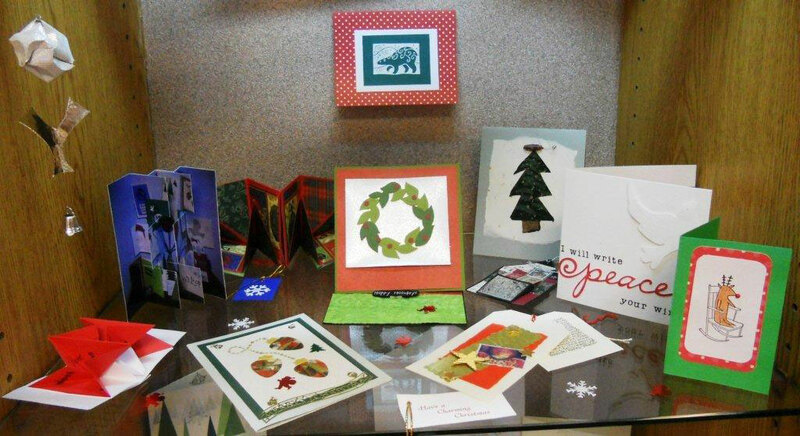 Every year North Redwoods Book Arts Guild members create a large number of Holiday cards. 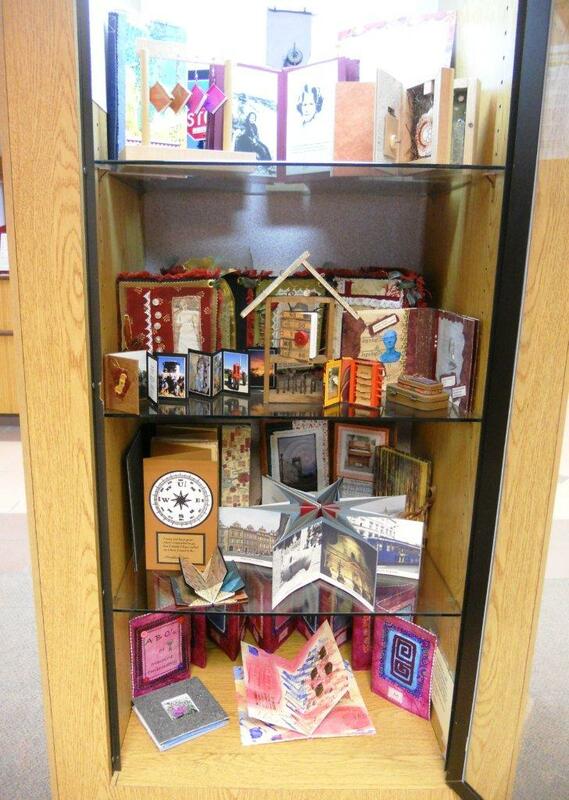 The kiosk is filled with some of these gems so head down to the library and be inspired to create some of your own. 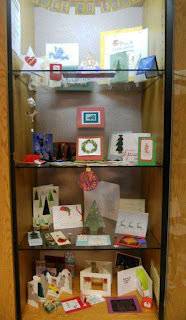 Thanks Becky M. for the great displays and Dolores G. for the photos. 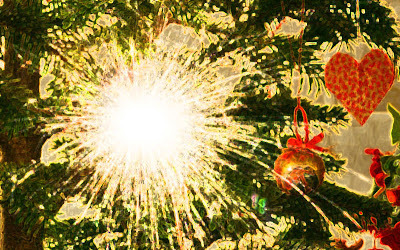 Date: Saturday, December 8, 12 noon. See newsletter for directions to Sandy's home. 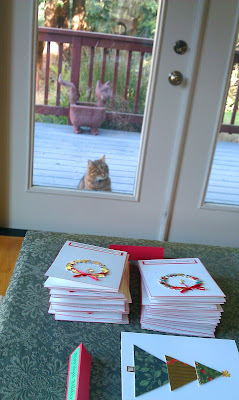 You do not have to be in the card exchange to join in! Everyone is invited and asked to bring a goody to share (please, nothing too gooey. Finger foods are requested). 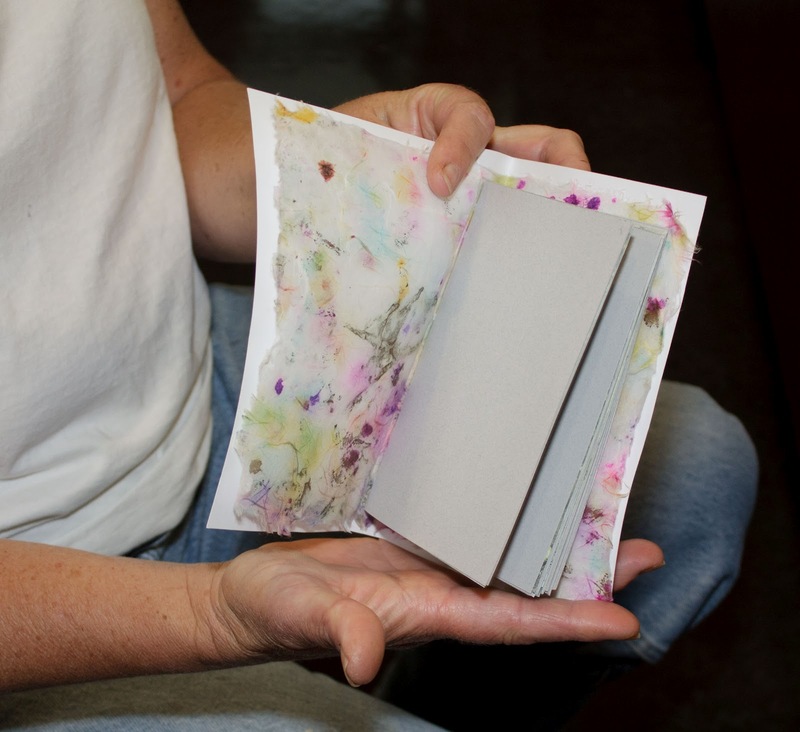 In this workshop we will play with variations of the Hedi Kyle "Blizzard Book" structure. The "Blizzard Book" is so named because one day Hedi couldn't get to work due to a blizzard and used that time to play with paper by doing experimental folds. This is that structure, and hence its name. The beauty of this structure is its versatility; it can be used as a spine, a hidden surprise fold, a book on its own, or a series of pockets in which content can be arranged, removed, or replaced at will. 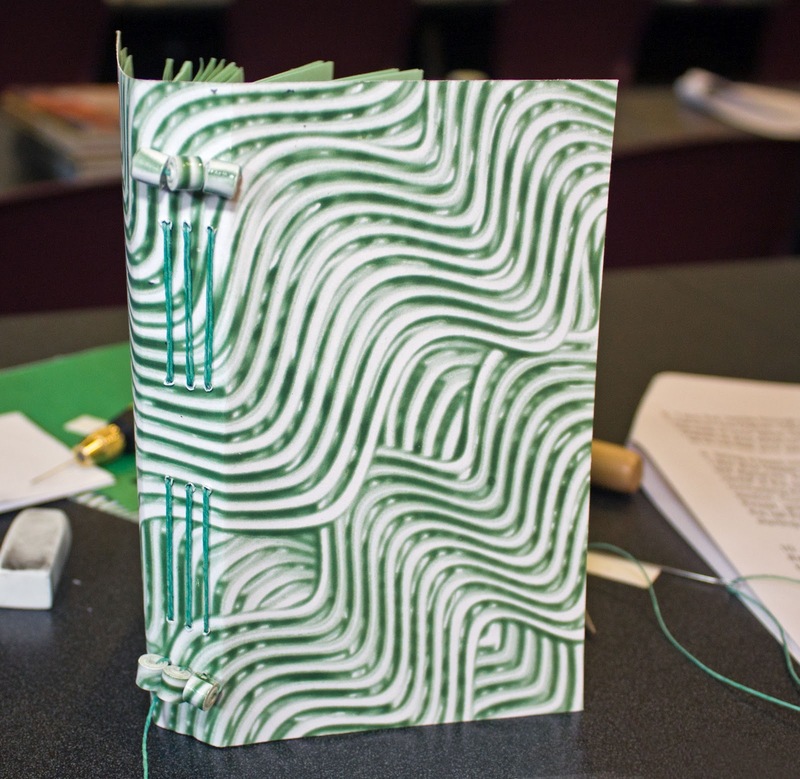 No sewing is involved – this book is made by creative folding of a single sheet of paper. 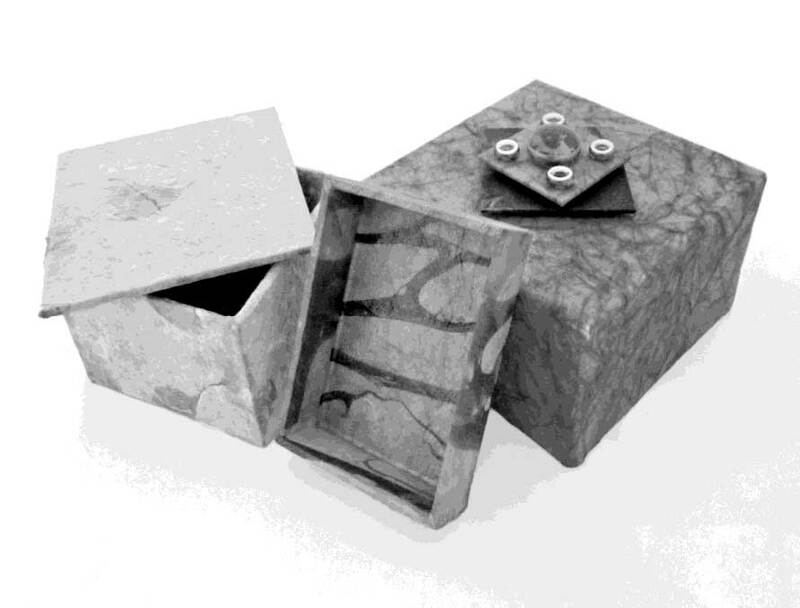 We will make at least 4 variations, each one a prototype. email or phone no later than Wednesday, November 7. Cost $1.00. See newsletter for contact information. Saturday November 10, noon, usual place! See you there. 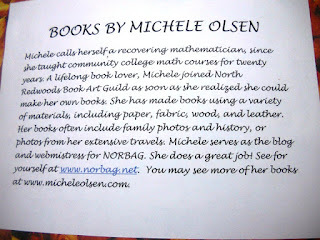 Becky has assembled another set of books from a NORBAG member—Michele Olsen. 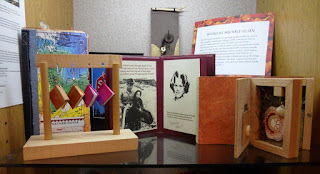 Becky described handling the books as a "tactile" experience because the books are often made of fabric, wood, or leather. While viewing them through a glass kiosk won't provide you with the same experience, you will see a wide array of structures created by Michele during her 10+ years as a NORBAG member. 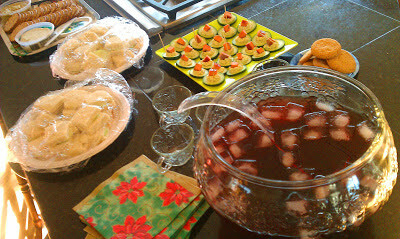 Enjoy and thanks to Dolores for the photos. 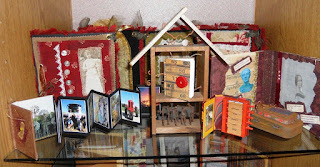 Boxes for presents, boxes for candies, boxes for trinkets, and boxes for BOOKS. Everyone loves them and everyone can make them. 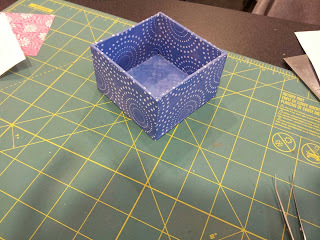 Our October Workshop showed us that they can be made with precision and even better, they can be covered with decorative paper in such a way that there are no overlaps or gaps. Perfect. 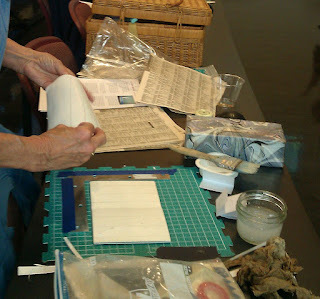 Sandy, thanks for another great workshop and thanks to Beth M. for the photos. 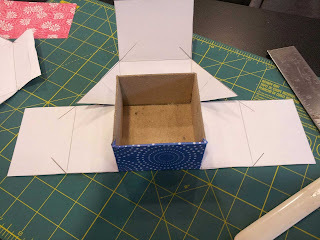 Let the box begin. School paper cutters are great for cutting bookboard. 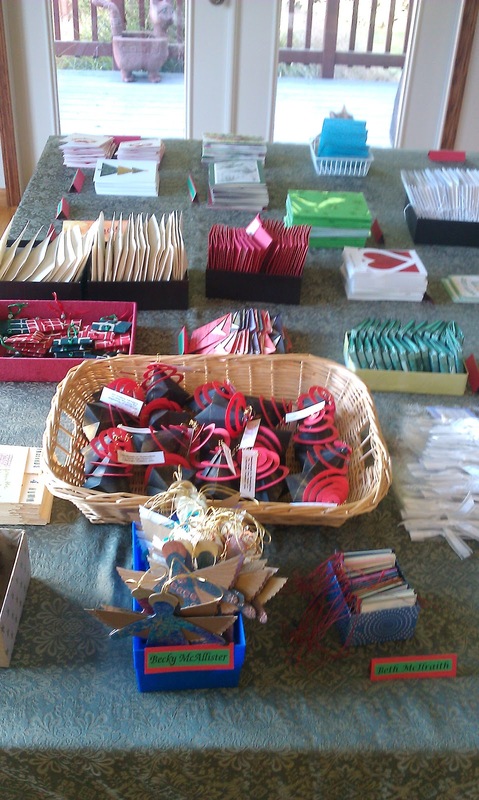 Everything matches up and is glued. 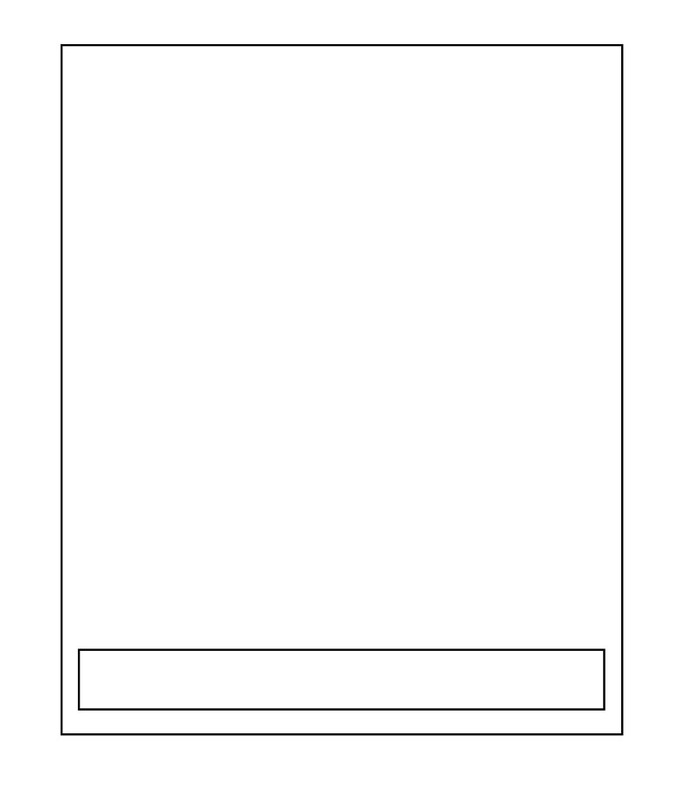 The paper template is the secret to a great cover. Two sides done—two to go. 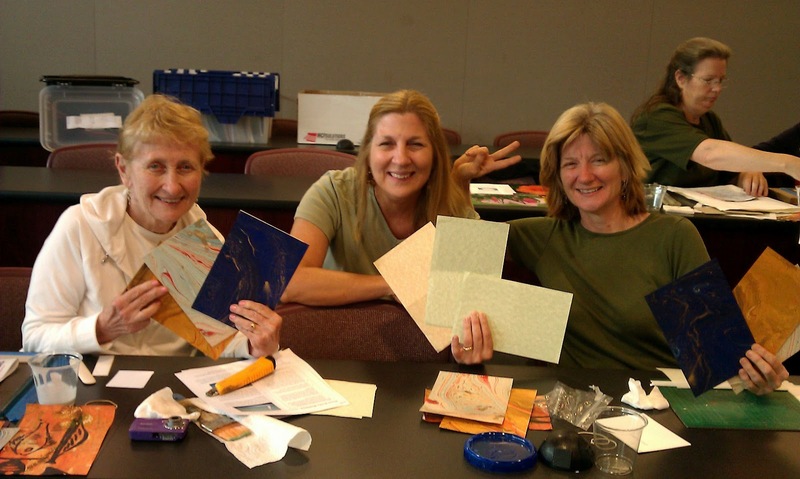 At our October workshop we will learn the basics of box making. Boxes can be used as part of our bookmaking process either to hold a book or as part of a book. In the workshop you will learn how to make a box and then how to cover the box with decorative paper. 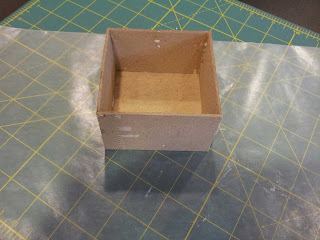 We will also learn how to make two different types of lid that will fit our boxes. I will provide a ready-made box for you to cover and pre-cut bookboard for making a second box and lids. 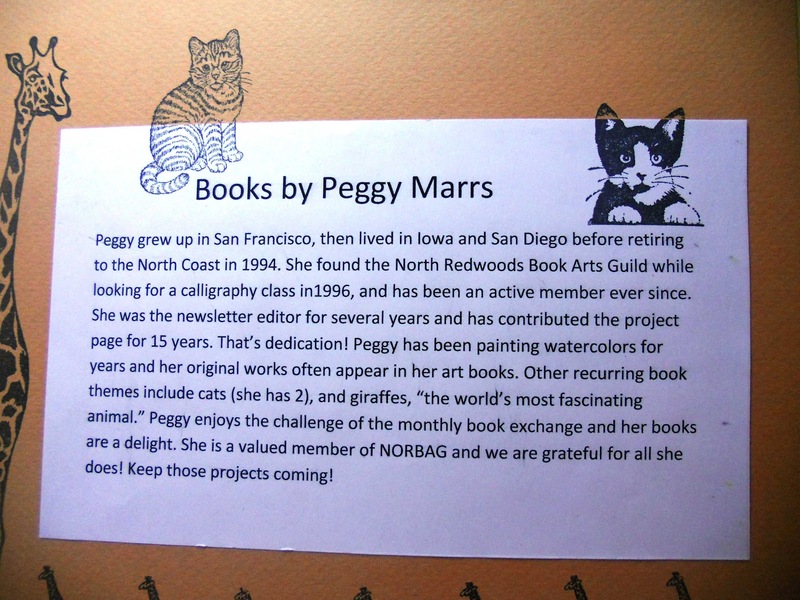 Our Humboldt County Library has been featuring the wonderful books of Peggy Marrs. 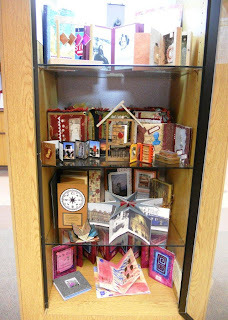 Do go by and see these, in the kiosk behind the checkout desk. 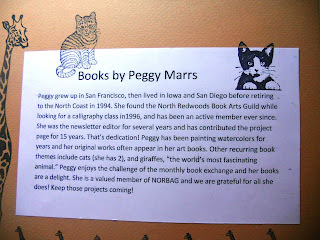 Peggy's books display her great book art skills, imagination, and humor. Her watercolors are delightful. 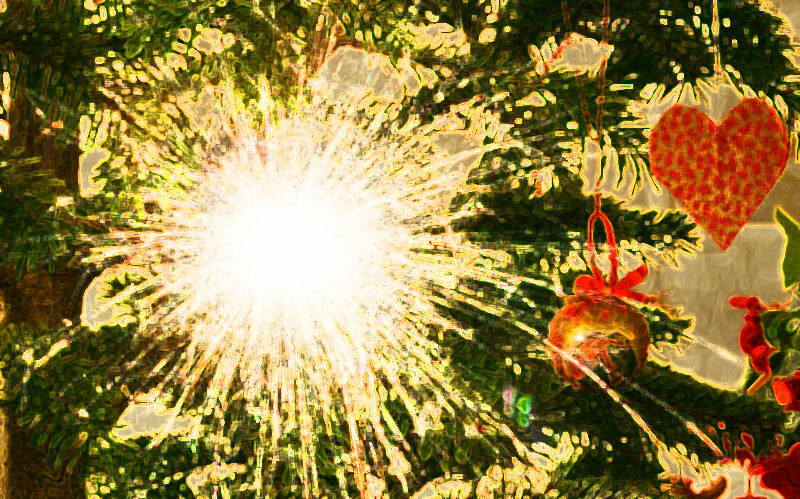 Click on the photo to see a larger version. Saturday, September 8, 12 noon. Materials Fee $1. RSVP Dolores. 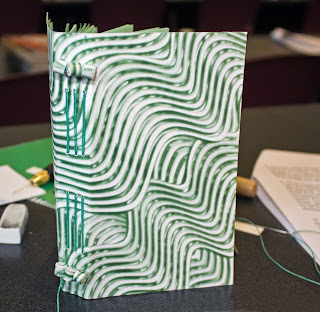 Coptic binding refers to methods of bookbinding developed by early Christians, the Copts, in Egypt and used from as early as the 2nd century AD to the 11th century. 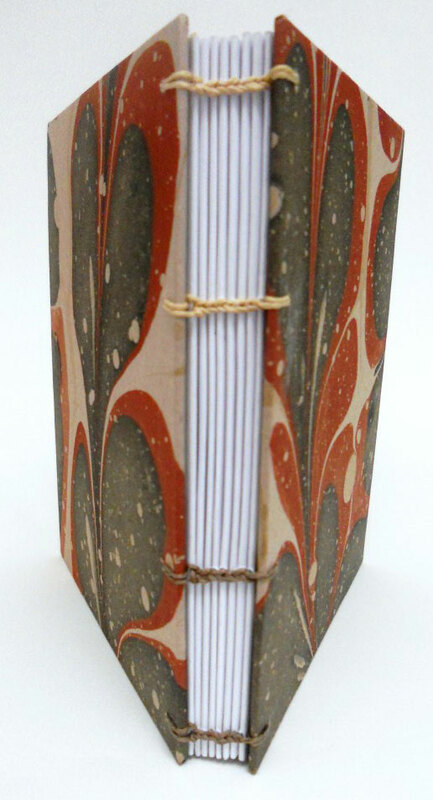 The exposed spine highlights the sewing. 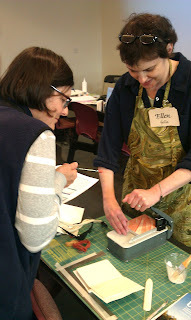 There are two types of Coptic binding: single needle and double needle. We will be learning the double needle variation for this workshop. 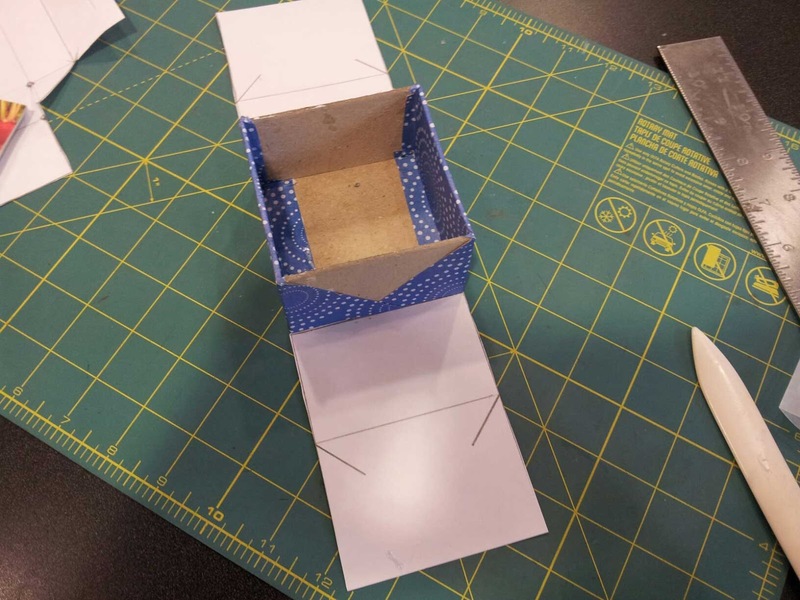 My philosophy in teaching workshops is to provide instruction and guidance for the creation of a prototype of the structure. With this model in hand you will be ready produce a beautiful end product at any time. 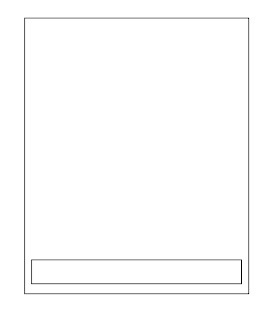 16 pieces of 8 ½" x 11" text weight paper cut in half to 5 ½" x 8 ½"
5 ½" x 4 ¼"
Note: you have the option of sewing on plain boards (mat board or illustration board) or, if you wish, you can cover your boards ahead of time. 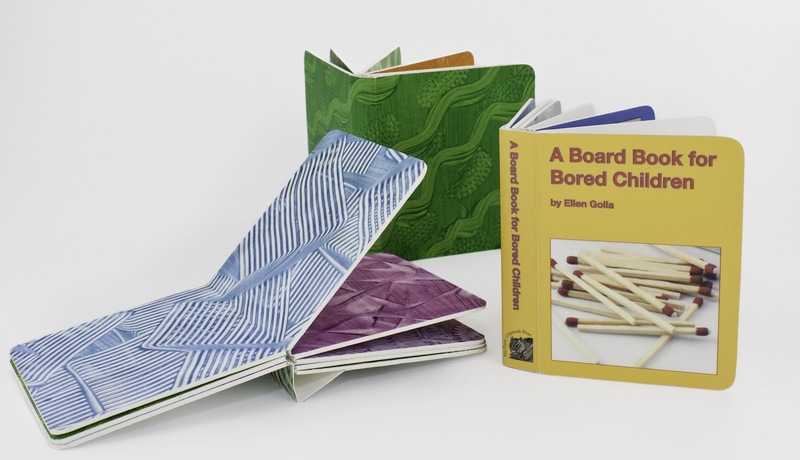 Please make sure that the grain of your decorative paper matches the grain of your boards. 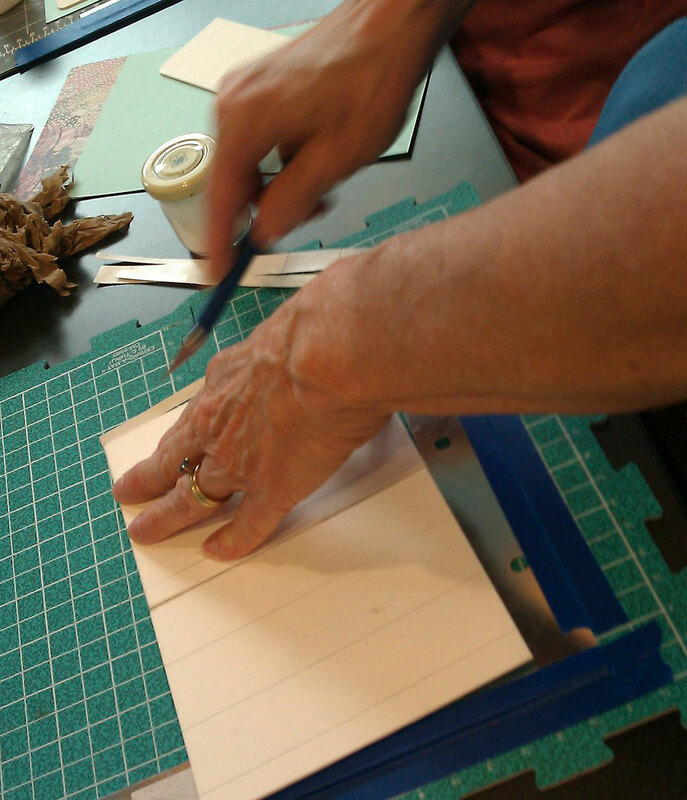 You will need to cover both sides of the boards and they should be done prior to the workshop and put under weights overnight. ♦ Piercing Cradle: if you have one, otherwise extra cradles will be available at the workshop. 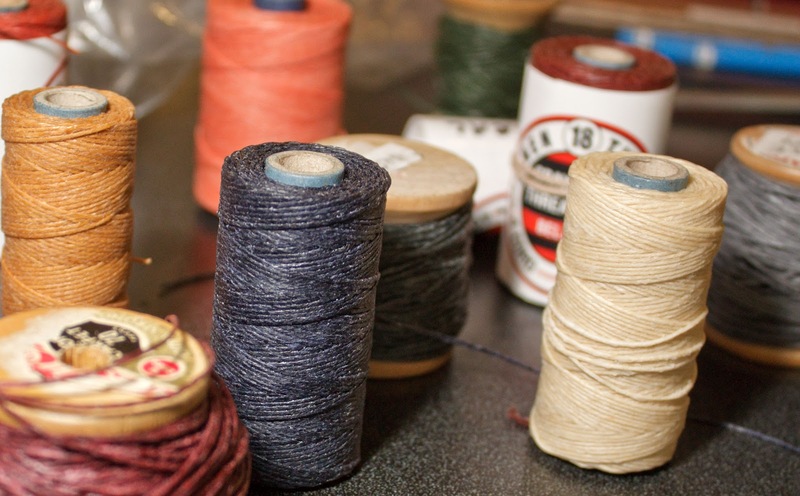 ♦ Thread: You can supply your own thread, or use what will be available at the workshop. Please see information about types of thread at the end of this article. Note on Needles: For this workshop, we will be using 4 needles per book, which will be provided as part of your workshop fee. They will be blunted, bent and ready to use. If you came to the July workshop, you received a needle box, please bring it with you to store these needles. 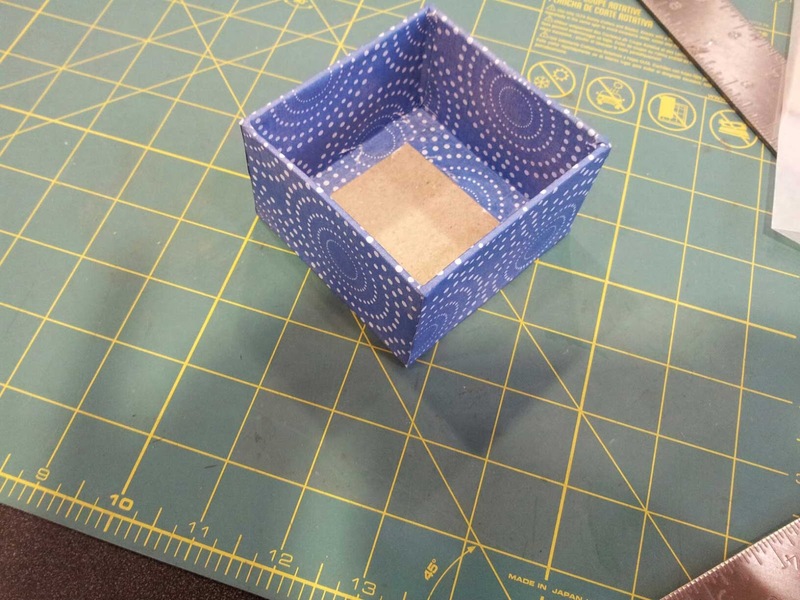 If you weren't at July's meeting, boxes will be provided. Curved needles will also be available for you to try as an alternative to the bent needles. Note on Thread: Because this is an exposed spine, colored thread shows off the binding to its advantage. I prefer DMC Cotton Perle #5, available in numerous colors both at JoAnns and Michaels (around $1.60/skein). 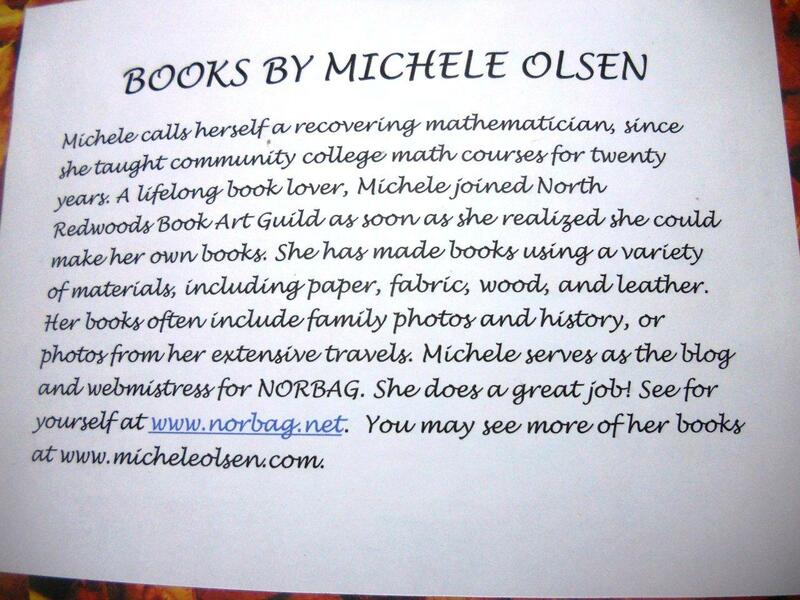 You may purchase your own (to match or complement your covers) or use what I will be bringing. I suggest a lighter rather than a darker shade to best show off the Coptic stitch. 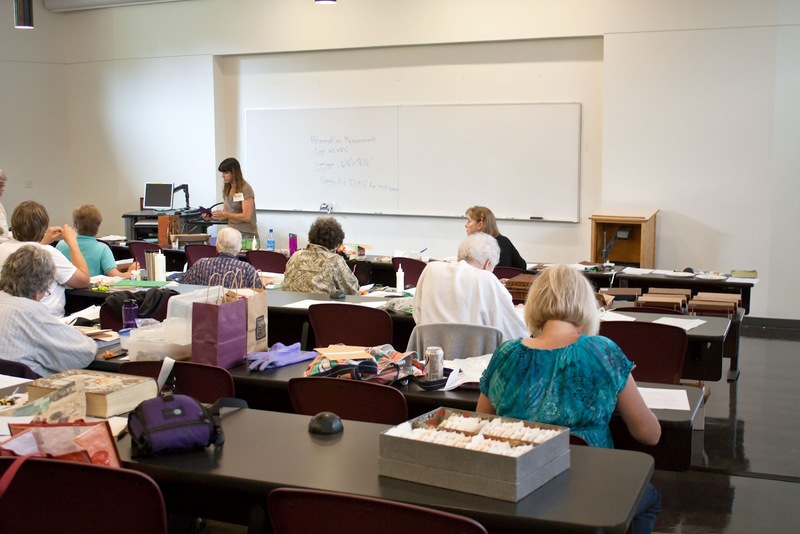 You can also use 6-strand embroidery thread, carpet thread, buttonhole thread, or waxed linen. 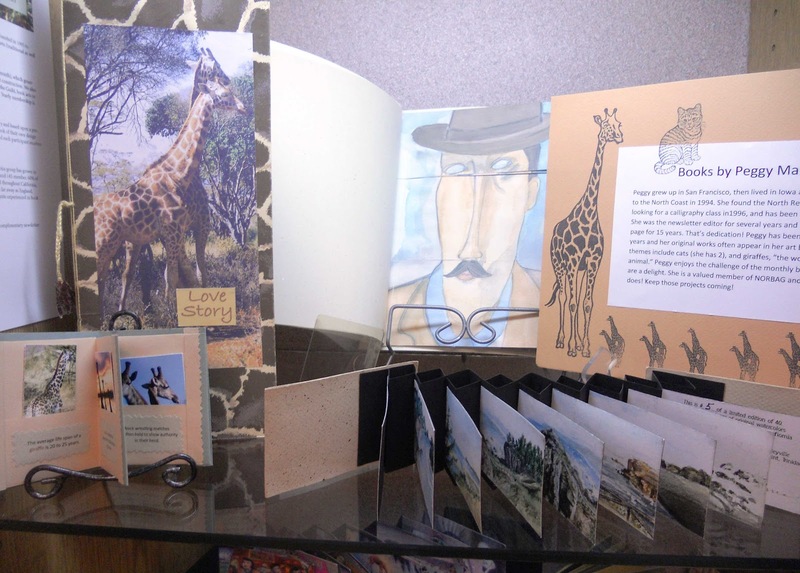 Ellen Golla's impressive collection of board books! Felt like kids again. 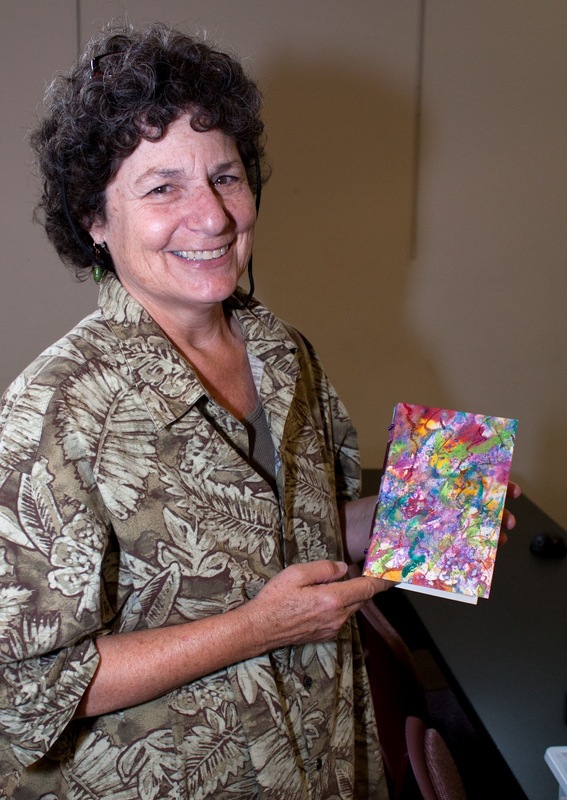 Board books created during the workshop turned out to be much more than "child's play". Instructor Ellen Golla demonstrated that the structure is ideal for creating carved pages, providing two page layouts, or for opening flat. Accuracy counts. 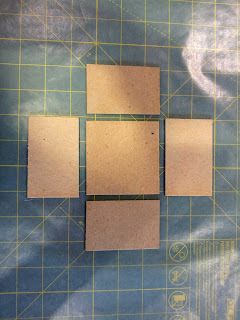 Improvised square for assembling. 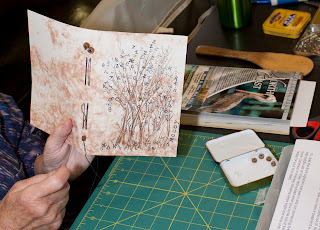 Two boards at a time are glued to decorative paper. Cindy with her sister and mother joining in the fun. Ellen demonstrating her spiffy corner punch. This versatile structure is essentially the same as that of most commercial children’s board books. 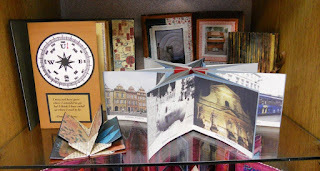 It provides page spreads that lie flat with no stitching, and the books have a satisfying weight and bulk. Ours will include a drop spine, a common feature in commercial board books, which allows the book to have a tight fitting cover yet still have room for the pages to open flat. 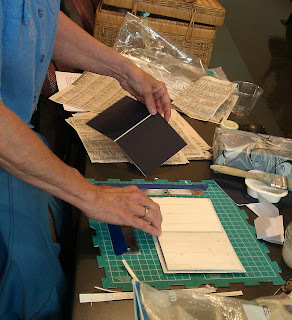 For those of you who like to alter board books, consider making your own from scratch! 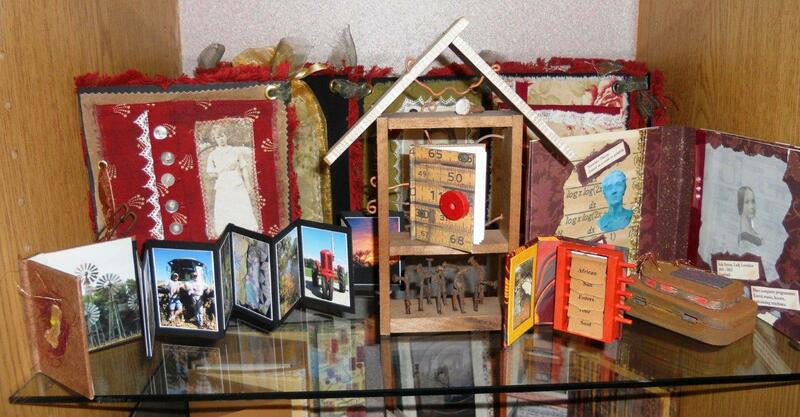 Examples, both handmade and commercial, will be brought to give ideas of what can be done with board books. 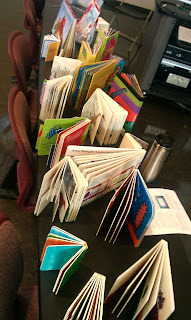 Some board book examples made by the instructor. 6 boards: 5 x 4", grain long, plus an extra scrap to use as a spacer. These can be 4-ply museum board, illustration board or mat board. 5 pieces of card stock or similar weight papers for page spreads: 5½ x 8½", grain short. 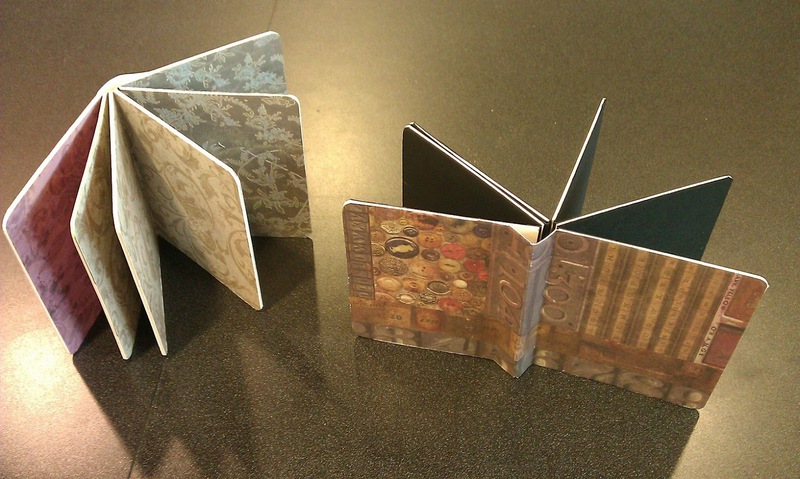 1 piece of card stock or similar for the cover: 5½ x 10", grain short. 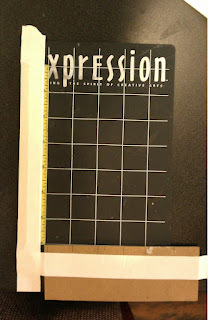 Note: The more straight and squared your boards are, the better your book will look. Cut carefully. It also never hurts to bring a few extra pieces of board or paper in case of unforeseen disasters. 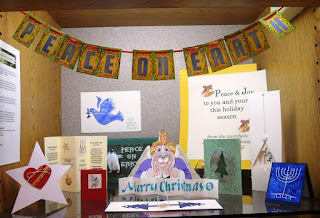 The Art Center in Arcata and Ellis in Eureka are good places to check for museum or illustration board. NORBAG members get 10% off at Ellis. 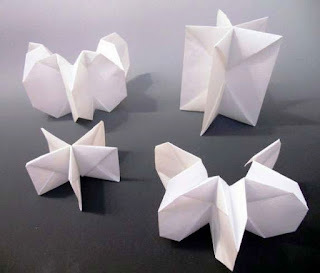 If you are new at this or still unsure how to determine grain, search online for "paper grain." 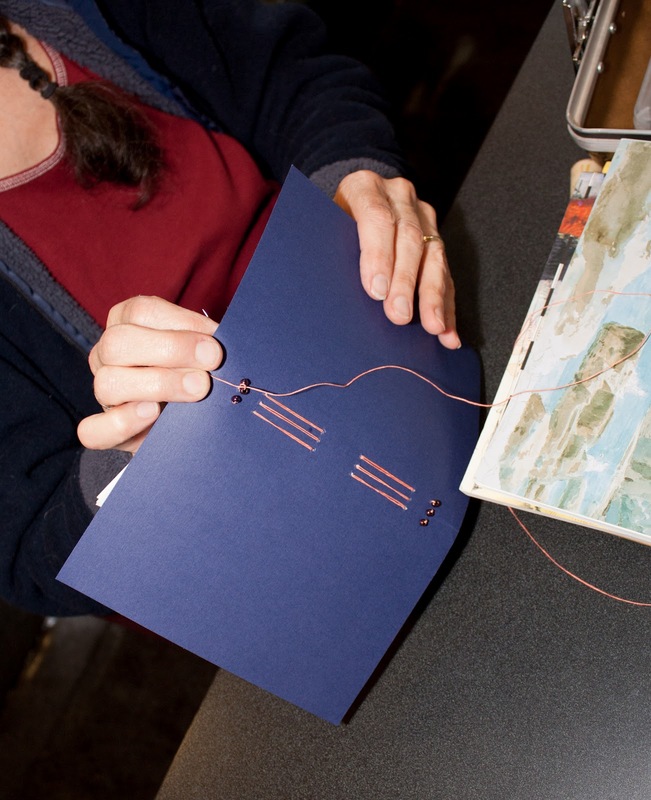 Most how-to bookbinding books also have an explanation of this. Provided: Written instructions and extra glue and drafting tape. A heavy-duty corner rounder will be available if you want to add that finishing touch. 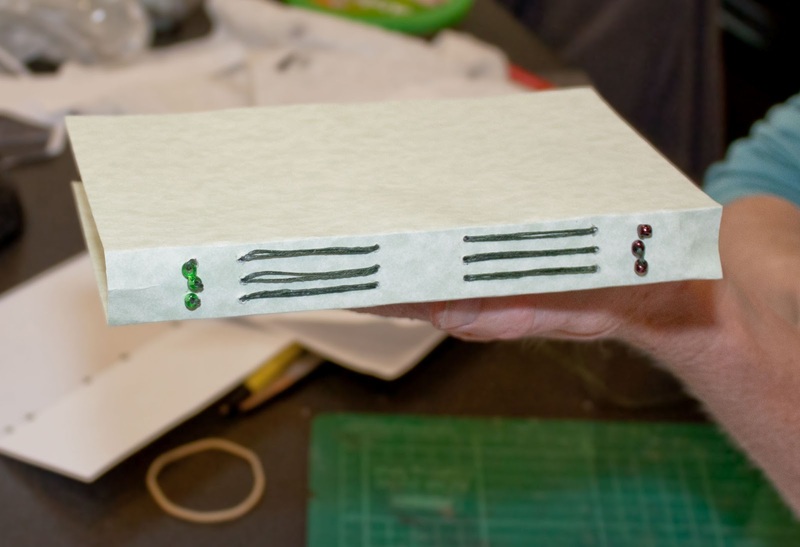 A diagram of a jig made from book board. Please don't use a cork-backed ruler. 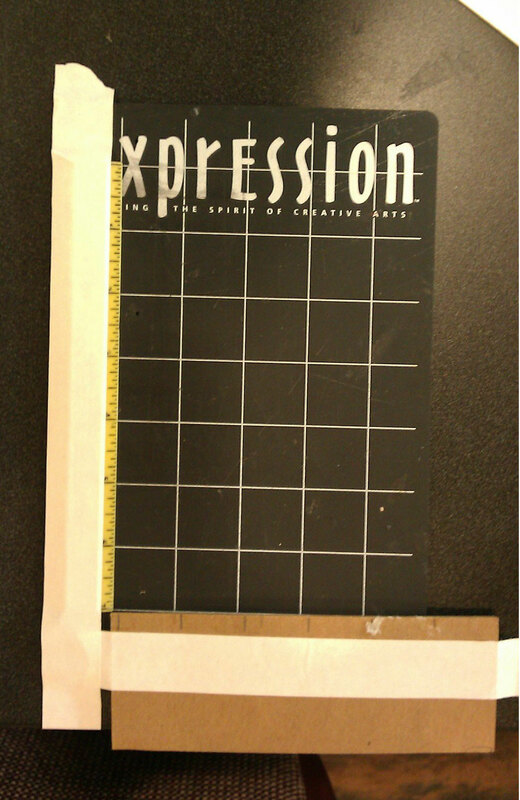 We're going to be using our straight edge to align our boards. The boards will slip under a cork-backed ruler, but if you turn over the ruler to avoid that problem, the cork might be damaged by the tape we'll be using. Most of all, plan to have fun. Board books are addictive! Please note: This was originally posted with incorrect dimensions for papers and boards. It has now been updated to show the same dimensions as is in the newsletter. 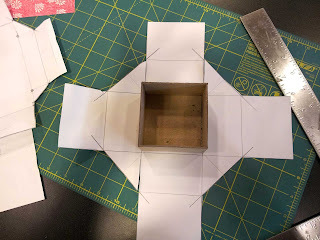 If you've already cut your boards and paper with the previous measurements that were shown here, go ahead and bring them--they will still work fine. Sorry for the confusion! 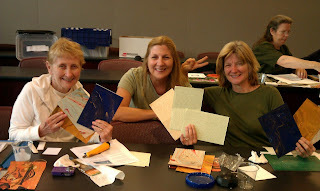 We had a great time at our last workshop learning the secrets of Long Stitch Binding. Carefully listening to our expert and patient instructor. We got to admire lots of nice waxed linen. We like waxed linen. Some brought some interesting covers. 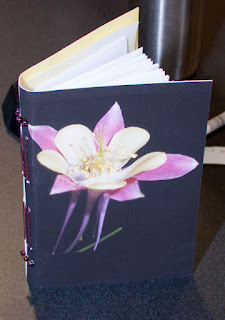 Another example with a decorative cover. And another with a decorative inside cover. Feeling a bit wild, perhaps? 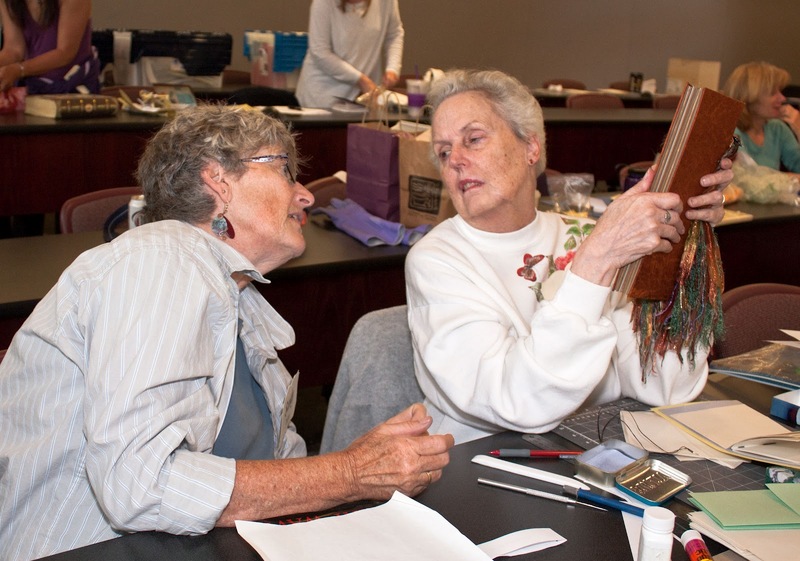 Discussing the finer points of Long Stitch technique.